Official Fate/EXTRA CCC x Fate/GO Campaign Announcement News Link! Nero Claudius (Bride) will be receiving sprite and battle animation updates! A new Interlude Quest will be available for Nero Claudius (Bride), which will provide a Noble Phantasm upgrade! The Mystic Code, Memories of the Far Side of the Moon will be available for a limited time! Clear the Mystic Code Quest to unlock the Mystic Code permanently. 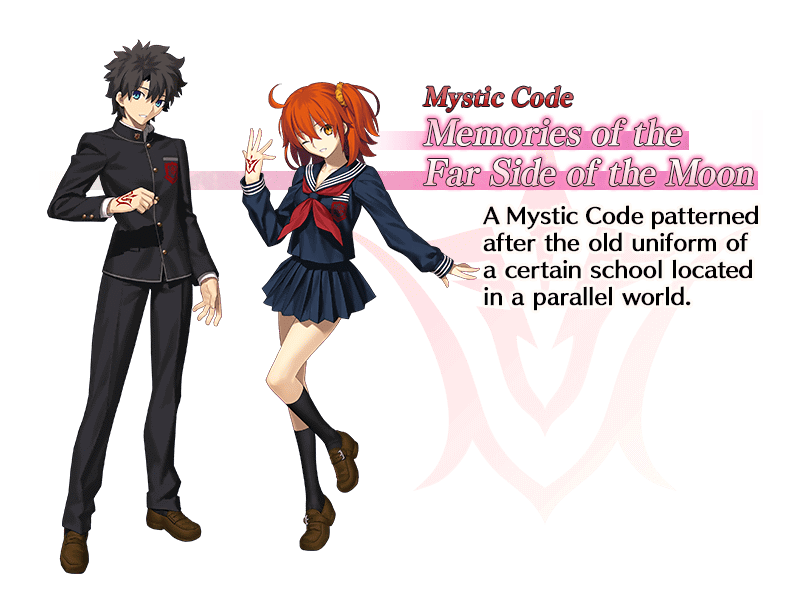 Please find our advice, short review and tips on the Memories of the Far Side of the Moon Mystic Code page! (We've also updated the ranking and pages for ALL other Mystic Codes). In celebration of the Fate/EXTRA CCC x Fate/Grand Order Collaboration, My Room will have a new appearance during the campaign! Given that Solomon Completion will be required for the upcoming SE.RA.PH event, all Main Quests from Fuyuki to Solomon will be 1/2 AP! Unlike the rest of the pre-event, the Main Story 1/2 AP lasts from 2019-04-09 21:00 - 05-07 20:59 PDT. All Fate/EXTRA Servants' Interludes will cost 1/2 AP! In addition, all Fate/EXTRA Servants' Rank Up Quests will cost 1/2 AP! Critical Strength +20% (MLB 25%). Gain 8 (MLB 10) Crit Stars per turn. Start NP Gauge at 50% (MLB 60%). Overcharge NP by 2 stages (1 time). Max HP for all allies (including Sub Members) +1,000 (MLB 1,200). Crit Star Gather Rate +300% (MLB 400%). Damage Cut 300 (MLB 400). ATK +25% (MLB 30%) 3 turns. DEF +25% (MLB 30%) 3 turns. Debuff Success Rate +15% (MLB 20%). Critical Strength +40% (MLB 50%). When equipped on [Divine] Servants only, NP Strength +15% (MLB 25%). Note: Also available from the FP gacha during the event period. Nero Claudius (Bride) is LIMITED, and is only available during special summoning campaigns. She will NOT be added to the general summoning pool after the campaign ends. Gilgamesh is LIMITED, and is only available during special summoning campaigns. He will NOT be added to the general summoning pool after the campaign ends. Nero Claudius is Story-Locked, and is otherwise only available from Story Summoning after clearing Septem. She is NOT obtainable from the general summoning pool. Gawain is Story-Locked, and is otherwise only available from Story Summoning after clearing Camelot. He is NOT obtainable from the general summoning pool.